After 16 years of scootering and 2strokebuzz, it’s easy to forget what attracted me to the machines and people that make up this dumb subbacultcha. If the first third of this video doesn’t make you want to stay up all night prepping your bike for a 5am, 250-mile rideout with some friends, there’s something wrong with you. To our newish friend Bo and our oldish friend Bart, who shared the link on the facebooks, thanks for the reminder! If you’re like me, you hate the idea of the city of Las Vegas on principle, but it’s worth the trip every few years to remind yourself, “anywhere is incredibly fun, with enough scooterists.” I skipped the rally this year, but our pal Jordan from the Mayday SC was there with the mob of British and U.S. scooterists, and brought back a bunch of great photos. Thanks, Jordan! Jen points out that Heritage Helmets now offers Trojan Records helmets to go along with their Consortium-approved Lambretta helmets. They even offer one with both Trojan and Lambretta logos, which is kind of surreal. Beautiful stuff, but, once again, they totally forgot the part that covers your chin and face. If you can afford an extra helmet for parades and photo shoots, pony up! From the Lambretta Motorcycles Facebook page, here is a video that even the exclusive vintage Lambretta lover could enjoy. Maybe a common enemy can be the tie that binds? Doubtful. A few years back, Lambretta Clothing teamed up with The Who to reissue some of the band’s Mod-est attire, including the famous parka from the cover of Quadrophenia, pre-stenciled for your convenience. Apparently Lambretta marketing contracts aren’t worth much these days, so with a new Quadrophenia CD/DVD “Directors Cut” box set coming out, they’ve switched alliances to Vespa. 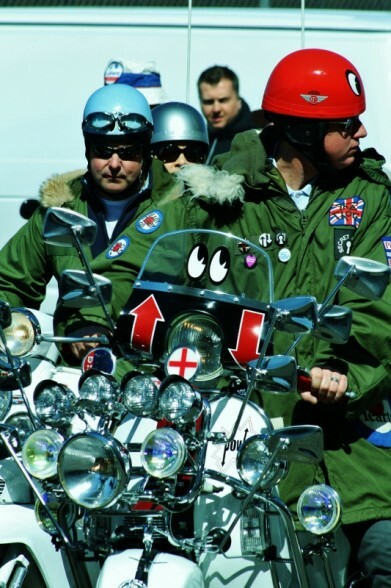 Mancunian twit Liam Gallagher will display a new PX125-based Quadrophenia scooter, film memorabilia, and Who-insipired fashions–including (again) the Quadroparka–at his Pretty Green clothing store on (where else?) Carnaby Street. In other news, Noel Gallagher has installed turnstiles at Easington Colliery, charging punters £5 to urinate on a lump of concrete. Quadrophenia, aside from its obvious charms to scooterists (and I admit a compulsion to watch it occasionally), isn’t much of a film and is even less of an album, so it’s interesting to see it repackaged yet again. Confusingly, (“Director’s Cut?”) this new 6-disc set doesn’t include the film at all (the DVD is surround mixes of the album), and omits all the great music (by the Who and other R&B greats) that appeared on the original soundtrack, which was re-released in 1993 and 2000. The album (as opposed to the soundtrack) isn’t horrible, it’s just neither the Mod music that’s the subject of the film, nor the Mod revival music that sparked its release. It’s exactly the noodly late-’70s stadium rock that Revival Mods and Punks were rebelling against at the time. It may be sacrilege (and completely against the point), but I’ve always felt, aside from a couple tracks, the film would have been better off with all music from the mod era. The book included in the box set is the most compelling component, I’d be far more interested in the backstory and Townshend’s memories than hearing demos and gimmicky 5.1 mixes. Townshend calls it “…the best album that I will ever write,” but it says a lot that the album was blocked from #1 on the charts by Pin Ups, David Bowie’s great ’60s cover album… containing two early Who songs. Just what Brooke was hoping for: Motoblog’s report (and great photos) from the Lingotto Special event from Motoblog. I didn’t realize how unique the Lingotto test track is, that must have been an incredible experience! Between July 1955 and July 1956, Wim Dussel and Manfred Uschold travelled the world on a Maico scooter with sidecar. 36 photos (from 10,000 negatives!) were published in Dussel’s 1957 book De wereld is nog altijd rond : per scooter dwars door Europa, Azië en Noord-Amerika, more than 400 are published in this must-see photo set. Italian tenor (and Ducati ambassador) Salvatore Licitra was seriously injured in a Vespa accident on August 27, and died Monday after two weeks in a coma. Doctors suggested it was likely that Licitra lost control of the scooter after a brain hemorrhage. 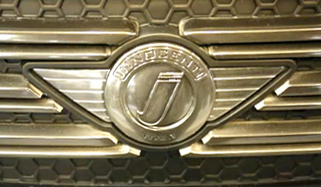 PR agency Life Longari & Loman’s nicely done glamour reel of the new Lambretta LN, with narration in Italian (and confirmation that Alessandro Tartarini designed it). Generally I like to go on at great length about these, but it’s five minutes to Thursday and I have a lot of American Scooterist work to do still. More importantly, I don’t know jack about these guys aside from what I see on their Myspace page. They’re English, they’ve been plugging away at it since 2005, and this video is from circa 2008. The video’s got a good chunk of joyful P-series Vespa riding footage shot with a secret prototype Holga Super-8 camera and cross-processed for a nice vintage look. Author illnoisePosted on 20.07.11 Categories Music, Vespa Vid. Veds. This video just couldn’t wait for Vespa Video Vednesday. Via one of our new Des Moines Facebook homies, Matt Baker.